Despite its unconventional beginnings the Law Society strove to emulate its British counterparts. Not only was it to perform similar functions but it adopted a number of the traditions of the Inns. In the fall of 1820, the Law Society resolved to build its own “Inn.” It too would accommodate the offices of the organization, house its library and provide chambers for law students and lawyers. It would give respectability to the profession. 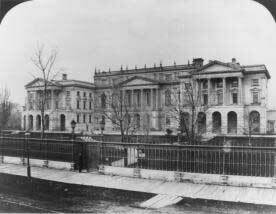 The Law Society’s inn, at the corner of King and Church street in Toronto,3 would be named Osgoode Hall. Robinson’s role in the whole transaction is intriguing. Since he made a handsome profit on the sale some argue that he capitalized on his privileged position.14 As Attorney General and a Bencher of the Law Society, he had a foot in both camps. He was the one who moved that the Law Society turn down the Executive Council’s original grant of 6 acres, only to sell them the same acreage (less if one counts the three acres allotted to the courts).15 On the other hand, even if Robinson was a political adversary of Treasurer Baldwin, he shared with him the vision of the Law Society as the cradle of future lawyers. Robinson was extremely active in Law Society affairs and he was on virtually every committee dealing with the construction of Osgoode Hall. He was the one who suggested that the Law Society apply to the government for land in the first place. He was probably counting on his influence on the Lieutenant Governor when he made the suggestion.16 Granted that he benefited from the sale. However, when the benchers of Law Society unanimously decided to purchase the plot they would have been aware of land values in Toronto, which were climbing quickly. Between 1827 and 1830, York’s population had grown by 58%.17 In addition, the Society was getting a choice portion of the lot, fronting Lot Street which was rapidly being developed. The Court of King’s Bench, headed by now Chief Justice John Beverley Robinson, was still eager to share accommodation with the Law Society. The judges moved in temporarily but were ordered into the new Parliament buildings by the Governor. The superior courts finally joined the Law Society on lot 11 in 1846, first as tenants then, starting in 1874, as owners of the western portion of the building. Since then, Osgoode Hall has been expanding periodically to meet the needs of its owners. Set in its broad, inviting lawns, surrounded by its remarkable fence, this architectural gem, the hub of legal life in Ontario, provides an oasis in modern downtown Toronto. 1. Many early lawyers in the province had limited legal education. They feared that an influx of better trained barristers from England may threaten their livelihood. See Moore, Christopher. The Law Society of Upper Canada and Ontario's Lawyers, 1797-1997. Toronto: University of Toronto Press, 1997, 30. for more on the subject. 3. In 1820 the Law Society owned land at the corner of King and Church streets and was planning on building Osgoode Hall at that location. There is no record of the purchase or the sale of this property in the Minutes of the Law Society’s board of governors meetings. Since the Law Society was only incorporated in 1822, the deed would not have been in its name. 4. The Law Society of Upper Canada Archives, Series 1-01, Convocation, Minutes of Convocation, First day of Michaelmas Term, 1 Geo. IV. 5. ibid, July 1st, 1825. 6. ibid, November 18th, 1825. 7. ibid, April 29, 1826. Minutes of the Executive Council for June 8, 1826. 8. The Minutes of Convocation do not specify the date at which the decision was communicated to the Law Society. However, at least one member of the Council was also a Law Society Bencher. One would expect that the Society would have been apprised of the Council’s decision soon after it was made. 9. The Law Society of Upper Canada Archives, Series 1-01, Convocation, Minutes of Convocation, January 9, 1827. Minutes of the Executive Council, June 7, 1827. 10. ibid, April 30, 1828. 11. “...the Legislature in selecting Simcoe Place for the scite [sic] of a Parliament House were doubtless influenced by the inconvenience and unhealthiness of the former situation.” Petition of Inhabitants of York 1830 [PAC, Upper Canada Sundries, v.98] quoted in Firth, Edith G. The Town of York, 1815-1834. Toronto: The University of Toronto Press, 1966, 30. 12. There is at least one example of the benchers’ meeting being moved to the Chambers of the House of Assembly to accommodate “... those Gentlemen Benchers whose public duty compels their attendance there.” The Law Society of Upper Canada Archives, Series 1-01, Convocation, Minutes of Convocation, November 12, 1825. 13. I could not have understood the intricacies of the transaction without the great knowledge of law and of the Society’s history of John D. Honsberger QC, LSM. 14. Robinson purchased 50 acres of Lot 11 for £1000 four months after the Law Society started looking for land. The price of £1000 for six acres represents a 800% increase in value in less than 3 years. 15. Brode, Patrick. Sir John Beverley Robinson: Bone and Sinew of the Compact. Toronto: The Osgoode Society, 1984, 166-167. 16. Dictionary of Canadian Biography. vol. IX. Toronto: University of Toronto Press, 1976, 672. 17. Armstrong, Frederick, H. Handbook of Canadian Chronology. Revised edition. Toronto and London: Dundurn Press, 1985, 275. 18. Moore, Christopher. The Law Society of Upper Canada and Ontario's Lawyers, 1797-1997. Toronto: University of Toronto Press, 1997, 79. 19. John D. Honsberger QC, LSM brought this hypothesis to my attention. 20. The Law Society of Upper Canada Archives, Series 1-01, Convocation, Minutes of Convocation, November 8, 1830.